Did you know that there are more than 20 million miles of underground utilities in the United States? Therefore, in order to avoid a potentially hazardous situation, it’s paramount that homeowners and excavator operators have underground utility lines marked with warning tape prior to digging. From completing landscaping projects and installing a fence, to building a deck or inserting a mailbox on their respective properties, homeowners will not only place themselves at a risk for injury by not heeding this warning, but also their communities as well. Digging in a negligent manner could result in service disruptions to the rest of the community and costly damages to gas, water, sewer and communication lines. How can you reduce the risk of striking a buried utility line? If your utility lines are not already clearly marked, then it’s important that you call 811 prior to digging. You should provide the 811 center with an advance notice of at least two days prior to beginning any digging project. This will give the center time to confirm which utilities will be affected and dispatch the utility operators to mark the buried lines. Once the lines are marked, you can proceed in digging around them. Remember, the intent of warning tape isn’t to inconvenience you, but rather to keep you and those around you safe! Notify: Simply dial 811, or visit the website to initiate a web ticket entry. Wait: Depending upon your state, it may take up to three days for utility operators to respond. Confirm: Verify that all utilities have responded to your request by checking the list of utilities that the call center contacted to the markings on your property. Respect: Use the utility markings as a guide to complete your project. Dig Carefully: Unless otherwise specified by state law, a minimum barrier of 18 inches around markings should be established to ensure your safety while digging. Diffuser Specialist would like to remind everybody that many utility lines are buried just a few inches below the ground. So, even planting a small flower garden or tree could put you at risk of potentially hitting a utility line with your shovel. 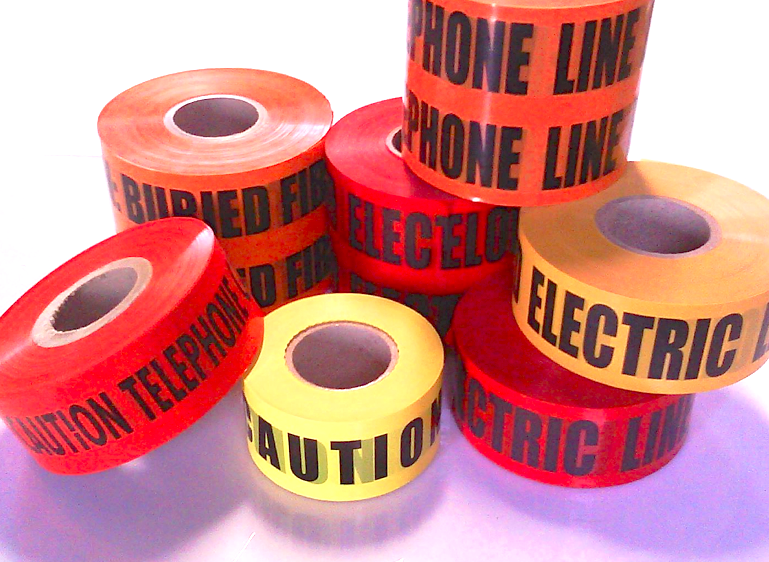 In addition, it’s important to update warning tape on a regular basis due to environmental factors that can shift the previous locations of utility lines. Why buy from Diffuser Specialist? If you want to become a lighting expert, then we invite you to subscribe to our blog.